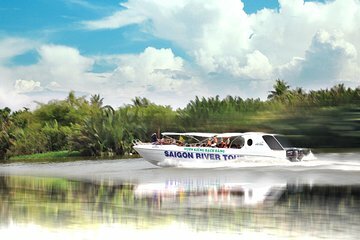 Fuja da energia e intensidade da cidade de Ho Chi Minh nesta excursão memorável pelas paisagens rurais do Vietnã. Escolha entre as saídas da manhã ou da tarde e siga o seu guia através de aldeias tranquilas e cenários pitorescos de montanha. Cruzeiro em um barco tradicional passado a ponte de Saigon e New Saigon Port. Você passará pela ilha de Thanh Da e seguirá para a vila de Binh Quoi, a versão da cidade do Delta do Mekong. Tire um tempo para passear a pé e desfrutar do ar fresco e arredores intocados. Você também poderá visitar o Templo Flutuante de Phu Chau, onde seu guia compartilhará detalhes sobre as crenças e práticas religiosas locais. The previous review I read on Viator about this 2 hour river boat cruise was spot on! This a a great little excursion for smaller children. Our kids had a great time on the boat and really enjoyed the captain and guide. Both of them were kind, gentle and took interest in the kids. The floating river pagoda was interesting and a highlight of the trip. Our children ages 5 and 7 were both very interested in what the guide had to say about the differences between the Chinese and Vietnamese dragons and why the Happy Buddha is happy! She was able to make the tour interesting for them as well on their level. The island park we visited after the pagoda was well put together and allowed the children to have a run about. I would recommend this tour without hesitation.